“The Body Snatcher” first saw print in an 1884 edition of the The Pall Mall Gazette Extra. Inspired by the events surrounding the infamous Burke and Hare and the surgeon Robert Knox who paid them to do what they did, Stevenson’s story is about two young medical students who also worked for Knox (referred to as ‘K’ in the story), and how their actions haunted them for the rest of their lives. The story begins with four men in an inn at Debenham. One member of the group is an old drunken Scotsman named Fettes who has been living in the town for a long time and is hard drinker. Fettes is obviously an educated man and because he has shown an unusual knowledge of medicine his friends call him the Doctor. On the night in question a guest at the inn has been taken ill. He is an important man and his personal physician has just arrived on the train from London. When the doctor arrives the Landlord mentions his name to the group. It is Macfarlane and on hearing the name Fettes snaps out of his drunken stupor and it becomes apparent that he is familiar with the man. Fettes confronts Macfarlane as he is leaving and it is obvious that the two men share a dark secret. After Macfarlane flees the inn Fettes shares that dark secret with his friends and the real story begins. “The Body Snatcher” is quite an enjoyable story and Fettes is a very believable character whose outlook on life is gradually changed by his experiences. At first he is flattered by Mr. K’s trust in him and is happy to take receipt of the specimens that arrive in the night. Later though he begins to have doubts about how the bodies have been acquired. Out of Loyalty to K he turns a blind eye to the evidence in front of him, but when he takes receipt of someone who he knew quite well and had seen alive and kicking only hours later, he has second thoughts about the whole thing and it is Macfarlane who talks him round and changes the way he sees things. As time passes the two men share an even darker secret and it is this that eventually tears them apart. 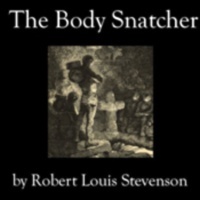 Jimcin Recordings audiobook of “The Body Snatcher” has a runtime of about forty-six minutes and John L. Chatty’s leisurely narration of this classic tale of terror is easy on the ear and will make a good addition to any audiobook library.